Risen is not your typical biblical story. It’s not lifted directly from scripture nor is it one of those modern “I was lost until I found God” sort of fictions. Instead, it takes a unique perspective of an unbelieving Roman soldier, Clavius, and gives him a mystery to solve and ideologies to grapple with. Movie buffs might recall The Robe has a vaguely similar premise, but Risen is not that film. 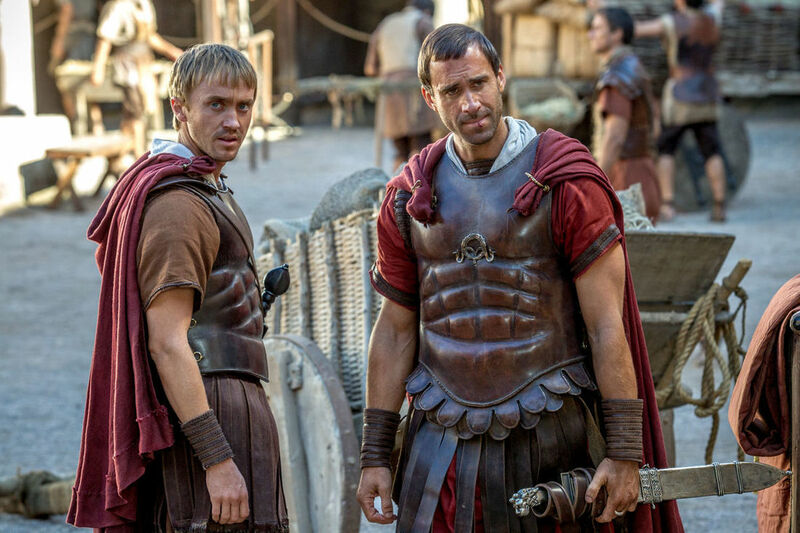 There is no simple resolution for Clavius, played by Joseph Fiennes. A war-weary Tribune ready to hang up his sword, he is stationed in Judea under Pontius Pilate (Peter Firth). Clavius is tasked with overseeing Yeshua’s (Cliff Curtis) crucifixion. When the body disappears from the tomb, Pilate tasks Clavius to find it in order to quell the rumors of a risen Messiah. Aided by his earnest young aid, Lucius (Tom Felton), the story becomes a detective mystery with the gruff Clavius interrogating the followers of Christ until he finds him alive and is confronted with something he’s never seen before. “When I read the script, I marveled at the fact that I’d just digested a biblical story that came across as an extraordinary murder mystery,” he said in the film’s production notes. He dove head first into the role, spending time in gladiator school in Rome and interviewing an actual detective in order to prepare. The second half of his preparation led him to spend time with a modern detective and learn tricks of the trade. Clavius spends more time cross-examining than fighting, and it was important for Fiennes to understand the detective side to the character. He said Clavius emerged through both the physical and mental preparation he underwent. One useful trick he learned from the detective was, in regards to odors, particularly the smell of death and how to hide it. For Clavius, Fiennes had a rosemary plant on his desk he would rub his hands on to disguise the scent of death and blood. It’s a clever trick that could be easily overlooked in the greater story, but it proves the genius of Fiennes and the director. A midline theme throughout the film was the idea of respect for the father figure and the patriarchy or the “pater familias,” for you classicists. For Clavius, his superior, Pontius Pilate, was very much a father figure. We get to see a different side of a man who’s known to history as Christ’s condemner. Peter Firth brought a complexity to Pilate that reveals how much pressure the governor of Judea was under in the years of Christ’s life and death. However, the film does not get bogged down in politics. It touches upon them just enough to give the characters a sense of urgency. Though Firth’s screen time was small, he commanded your attention while on screen. “You couldn’t get better casting,” Fiennes said. “He’s mercurial, he’s energized, he’s full of authority. And I love that relationship between Clavius and him. When Clavius discovers Yeshua in the upper room with his disciples, it is not a moment of instant belief but rather one of a shocked disbelief. Here is a man he saw dead on a cross only days before. Now, he’s alive. Thus begins Clavius’ private journey to understand. It is less of a faith journey and more of the Roman stance on trying to use reason and logic to comprehend an incomprehensible situation. Abandoning his post, Clavius follows the disciples, hoping to confront this “risen” man. There is only one true moment between Clavius and Christ. He awakens while the apostles are sleeping and joins Yeshua in viewing the stars. They share words in a brief dialogue that is no less charged due to its brevity. In order to keep the scene fresh and real, Fiennes and Cliff Curtis (Yeshua) did not interact on or off set. “The first time we ever spoke was the first time we spoke on camera in that scene,” Fiennes said. “I wanted to keep the chemistry, keep the emotion and the quality of what that interaction would have held for Clavius, whether it was a dream sequence or not. By the end, Clavius still hasn’t come to terms with all he’s witnessed. He doesn’t have an instant conversion. The struggle continues, and that is the genius behind the film. The expression of faith and the coming to terms with it is authentic and extraordinary. Risen is a faith story that even non-believers should see. It is simply an excellent film. It opens nationwide Feb. 19. As for Fiennes, his next project is Elizabeth, Michael and Marlon, a short film where he plays Michael Jackson on a road trip with Elizabeth Taylor and Marlon Brando. “I must admit, I had the same reaction (as you),” he said. The comedic film is a Sky Arts production and is set to release sometime this year. • Author’s note: This interview has been edited for clarity and continuity. It was originally published in GetOut, Feb. 16, 2016.